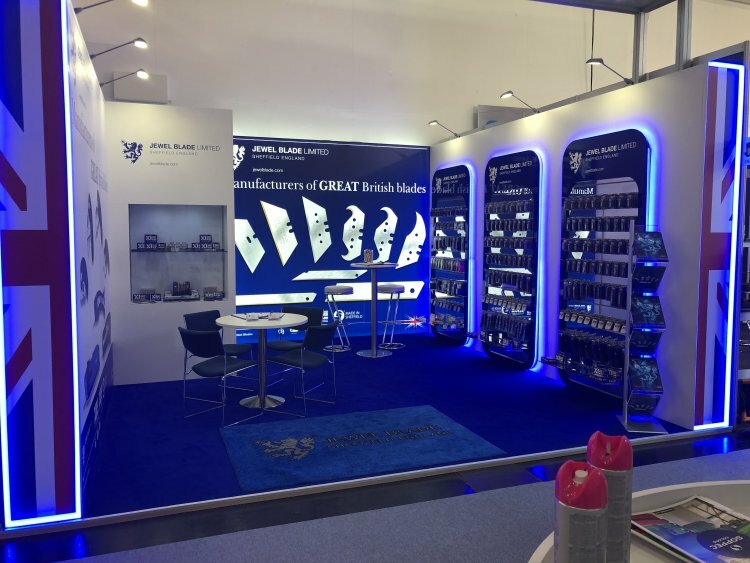 A GREAT start to the New Year for Jewel Blade in Munich, Germany as the Sheffield based manufacturer of consistently high quality cutting edge trimming knife blades attended the BAU 2019 exhibition for the first time. The World’s Leading Trade Fair for Architecture, Materials and Systems in the Construction Industry is where future-oriented manufacturers come together with an audience of interested professionals. BAU 2019 spanned over 200,000 square metres with 2,250 exhibitors from 45 countries showcasing their products and solutions for approximately 250,000 trade professional visitors from the building sector. Jewel Blade’s unique large capacity manufacturing facility enables them to deliver their competitively priced GREAT British blades from stock, guaranteeing fast delivery times and with an extensive network of overseas distributors they export to over 52 countries worldwide. Jewel Blade lead in setting the industry standards for the presentation and packaging of industrial products ranging from bulk options for industry use, to their sales enhancing retail packaging options designed to meet your business, product environment, brand image and customer requirements. “It was great to see how well received our brand and products were at this year’s trade fair. This was one of our most successful first shows at an exhibition" said Jewel Blade’s General Manager Julian Marshall. Next up for Jewel Blade is the ‘BUDMA Construction Fair’ in Poznan where they will exhibit from the 12th – 15th February with their polish representatives JK Industrial. Make sure you come and visit us in Hall 8A Stand 11. Click to download our company brochures and presentations. Introducing the XL Gold & Silver range - made for flooring professionals. Get the answers to common customer questions.